A while back, I kickstarted Shadowrun Returns. My Shadowrun experience is entirely through the Sega Genesis version of the game back in the 90's. I remember liking it quite a bit then, so I was definitely on board for a new RPG experience in that universe. The shooter version of the game has been stricken from the record. I was happy to learn that the game was released last week. I believe that is the 2nd game I've kickstarted that has been released, StarDrive being the first. Thankfully they got on steam, which meant no fuss getting the game and installing it. I entered my backers code, and voila, there it was. So far I have not put too much time into the game, just an hour or so. I can say I like what I see though. The first thing I noticed was the art. Sure, it isn't really stressing my graphics card or anything but I think they are excellent. They are quite detailed and colorful. Now to the title reference. Shadowrun appears to be entirely text based. I must admit, I've been spoiled by games lately and their voice overs. I'm just not used to reading large amounts of text in computer games anymore. Even though I found the dialog engaging, it was just hard for me to read. I need to get used to doing that again. One aspect I don't like about the game is the save system. The developers opted for automatic save points instead of a manual system. This makes it tough for me to hop in for some quick action as I have to get myself to the next save point. So far it seems like the save usually happens when you change areas. I really wish I could just save whenever I wanted to. Combat is fun so far, no real complaints. The quest system works pretty well. It seems pretty flexible with the dialog system. I was impressed by getting different dialog options based on items I acquired, stats and my style choice during character creation. Playing Shadowrun Returns reminds me I really should try and finish the new XCOM game too. Not sure why I stopped playing, think it was because I chose Ironman mode and did pretty much lost all my guys. It has been a while since I ran a contest, so when I saw Crusader Kings II discounted on Steam it seemed like a perfect opportunity. The prize up for grabs is The Old Gods DLC, Steam Edition. So you'll need to have Crusader Kings II on Steam to be able to use the prize. UPDATE 8/3: The prize now includes a copy of Crusader Kings II. So you will now win both the original game and the latest DLC. If you already have it, you can always gift it to a friend. This contest also lets me test out some new Sites with Benefits functionality. Specifically the addition of codes, Pinterest, and Twitch. These are pretty new, so let me know if you run into any problems. This will be a lottery, so complete missions to earn points. Those points can then be used to buy lottery tickets. The contest will end on Tuesday, August 6th. The winner will be automatically drawn. If you have any questions, be sure to leave a comment. Get started using the Sites with Benefits on the right. With SWTOR's 2.3 patch right around the corner, I thought I'd go over its features and grade them. Obviosly, I'm not grading based on execution of the patch since it is now out yet. Instead I'll be grading it on the the patches appeal to me, a mostly solo casual player. I've said it before, and I'll say it again. I hate dailies. I do however like new areas, so that's why this feature gets a B- from me. I'll go there once and do the missions. The theme of the new area is also appealing as I've always found the Czerka Corporation to be pretty cool. As I mentioned above, I play SWTOR mostly solo, so why did these get such a high grade? BioWare is introducing Story Mode Flashpoints with these, that means they are meant to be role independent. I may actually run these once now that they have an easier/quicker mode. I really just want to see the sights and experience the bosses. Again, I hate dailies. Sadly, that is the primary way you interact with reputation factions. I don't see myself getting anything out of this feature, although I imagine some people will. By removing the side speeders, it should make it easier for the points to be captured. Before, you got a constant stream of players coming back to the point to defend. Hopefully this will make for a more dynamic experience. Honestly, I've always thought SWTOR's graphics were pretty good. If they can improve them even more, then great. I'm not sure I'll even notice though unless someone does a side by side comparison for me. It's a decent patch overall, even if there is nothing that really caters to me specifically. I am pretty concerned about BioWare's apparent love of dailies. I do look forward to seeing the new Czerka areas though. Even though BioWare has taken SWTOR free to play and added a cash shop, I have yet to purchase any cartel coins. I am subscribed though, so I'm not really playing for free. I just tend to use the monthly allotments I receive. My Cartel Coin balance usually sits around 2,300. My normal routine is to spend coins on a single cartel pack when it is released. So, what would make me spend a good chunk of my coins, or make me buy some more? Legacy Bank Tab. Sure, you can mail items between characters in your legacy, but that is a bit of a pain. Instead, I'd love to be able to have a bank tab that they all could use. I would use it for crafting materials and companion gifts most likely. Take my money BioWare! Legacy Server Transfer. As it stands now, you have to purchase a transfer for each character you want to transfer to another server. I would like to see a nice bundle option where you can transfer everyone at once instead of paying for each one separately. This may or may not be the profitable move for BioWare, but it is something I'd buy. Mobile App. I would love to see a mobile app for SWTOR. Primarily, I'd want to be able to assign crew missions, but other features like mail, guild chat or the AH would be welcome too. I could easily see myself spending money on such a thing. Global Unlocks. I love global unlocks, like the inventory space one. I've bought that several times. I'd like to see more character perks become global unlocks, like the XP boosts. I'd be much more likely to buy them that way, even if more expensive. Big news around the Werit household, I got myself a new phone! My old phone was the original Motorola Droid which came out like 4 years ago or so. It had served me well, but it was time to make a change. I had a hard time even making calls near the end. I have also recently started a new job, which means I'll be mobile much more often, so it seemed like a good occasion. I'm generally a fan of Google and Android, so I wanted to stick with wheat I knew. The Galaxy S4 seemed like the new big kid on the block, so I went with that. A phone with 4 core processors, how crazy is that? It's probably as fast as my last computer. So I pulled the trigger and now am the owner of an S4. The title mentions mediocre, but that has nothing to do with the phone itself. It refers to the quality of this review. I'm just not good at doing them, especially for phones. I can only tell you how it performs for what I actually use it for. Phone Calls. Making calls is quick and responsive, unlike my last phone during its final days. I can also receive calls, which is a big plus. Understand what the person on the other end of the line is saying? Check. Web Browsing. It is a 4G phone, and I happen to be in the coverage area, yay! Browsing is quick and works well. The only frustration I've had is betting Flash to work. I had it going on the original Droid, but on this one? Not so much. It isn't a deal breaker though, as I should not be watching videos at work or while I am driving. Youtube works fine though. Twitter. It runs the Seesmic Twitter client. Just like when browsing the web, it's nice and speedy. No complaints from me. Music Playing. I use the Google Play music client to stream my songs from the cloud while I am at work. Works great so far. I really like the Instant Mix option so I don't spend my time setting up a playlist. That's really all that I use my phone for. I can't speak to how well the camera works (I use an actual camera ::GASP::) or how the phone bumping sharing works (NFC). There is also this eye watching stuff that responds based on whether or not you are looking at it. I have not really touched that either. All of the other goodies have gone untouched as well. I bought a Body Glove case for it as well. It was simple, and more importantly, cheap. I couldn't believe how expensive some of the covers were. $60 for a cover? No thanks. For that price it better also be a video game. Overall, it is a very speedy and easy to use phone. It does everything I want it to do, so I am pretty happy with my purchase so far. With the recent double XP weekends in Star Wars: The Old Republic, most of my gaming time has been spent in there. Specifically on my Trooper who is working his way through the Makeb expansion. I've still been taking it pretty casual, doing a mission here and there when I had the time. I'd also sneak in some warzones to help keep my XP on level. As I was playing, I thought I was nearing the end of the Makeb story arc. It felt like it was starting to wind up. I was happily mistaken though. 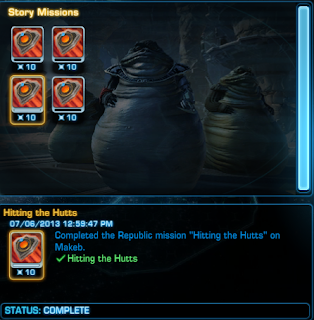 I saw an achievement, Hitting the Hutts, which when looked at showed 3 more story missions yet to go. So that was a very pleasant surprise, I still have a bunch of stuff left to do on Makeb. I'm definitely feeling like this expansion was worth the money. It's actually going to take me quite a while, real time, to finish it all up. I've decided to pursue some other interests in the game. My Trooper has started to do the Macrobinocular, Seeker Droid and GSI missions. These take you through some of the past planets which you have visited. Right now I am on Tatooine, and have loaded up my mission log with the GSI dallies, which I will do as I look for the Shrouds hidden devices and the Seeds of Rage. My plan is to alternate between Makeb and these other missions. That should stretch out the content pretty far for me. Especially considering we have 2.3 coming up soon which brings Story Mode Flashpoints and a new area to check out. 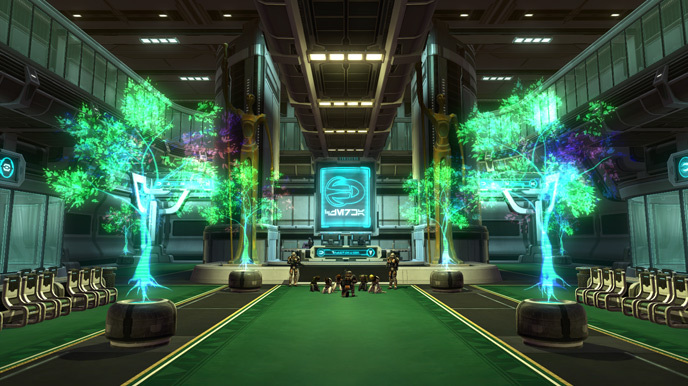 Coming soon to SWTOR is a brand new reoccurring live event: Bounty Contract Week. We know from the developer diary that it will happen once a month. It'll offer players a chance to complete lucrative bounty contracts on planets all over the galaxy. I took a look at what was on the PTS involving the event and here is what I found. Like any good gamer, I made sure to watch at least some of this years E3. Unfortunately (or maybe fortunately ) I was on vacation the same week as the conference. I only managed to watch Microsoft's offering, which happened to be the one I was looking forward to the most. Once it became available for Pre-Order, I immediately jumped on the Day One edition. I'm not really a fanboy of any technology, but I tend to lean towards Microsoft. I own a PS3 and Wii too. So the Xbox One was my primary interest this E3. Thankfully, they concentrated on the games during the conference. And they did indeed look good. One area of concern I have with the Xbox One is the fact MS is trying to make it an all-in-one media center rather than just a gaming machine. I honestly have no intention of replacing my Comcast cable box with a gaming console. Call me old fashioned, but I just can't seem to fathom using a gaming console for that purpose. The issue of used games blew up, as most of you probably know. I won't rehash it here, but I will say their plans don't really concern me. I don't buy used games or sell my games back. I probably should, but it is just something I've never done. So whether they go with their original plan or back out of it, it doesn't affect my decision to buy the console. The price of the console did give me pause. $499 isn't cheap, but it's also still not at Neo Geo levels either. I attribute the high cost to the included Kinect. I own the original, but really never use it. Will that change with the new one? I don't think it will, but I'll keep an open mind. Again, maybe I'm just getting old but I don't want to wave or talk to my console. As I read back through this post, it makes me think I don't actually like Microsoft's offering. It really comes down to the games for me, and I did like what I saw. Call of Duty, Battlefield, Madden, Ryse, and Titanfall all looked good. There were a bunch of other interesting games I can't remember at the moment. The Xbox One is set to release in November, which is actually coming up pretty quick. I need to start figuring out which games to get at launch. I remember how awesome Oblivion was when the 360 launched. Need to find a title like that. As for the PS4, I'm sure I own it as well at some point. It should come as no surprise to my regular readers that I usually prefer a solo experience. The only exception being PvP, where I like to fight along side other players. That means I generally skip group content, including Flashpoints. I've only done a handful of them in SWTOR. It's a shame too, as I am sure I'm missing out on some neat experiences. In SWTOR's 2.3 patch, BioWare is introducing Story Mode Flashpoints. Basically, these are dungeons that are designed to be completed by groups regardless of composition. Four DPS, no problem! It's an interesting idea which will allow for quicker queue time and quicker runs I imagine. Two flashpoints, Czerka Corporate Labs and Czerka Core Meltdown, will be introduced with the new mode. There will also be hard mode versions, but those are something I will certainly skip. Queue times are not really a barrier for me as I usually play as a healer. Rewards are also not much of a concern, as I don't do Operations ( except for the occasional LFR version ). So why would this new feature get me to participate. I'm banking on the Story Mode version to be quick and less stressful. Let's face it, dealing with other people, especially under the veil of anonymity, can end up being a pain. Without the holy trinity requirement, things might be a bit more fun. We'll have to see though. I do plan on giving those Flashpoints a try when 2.3 launches. Also, Czerka is cool. Dawngate is a new MOBA (read: LoL, DOTA 2 but with a twist) that has been making inroads into the scene lately. In fact, on Friday at 7pm EDT a live Dawngate beta event will be held in Denver at the Clutch Gaming Arena. In cooperation with The Noobist, it will be live streamed for everyone to see. There will be Dawngate Beta Keys given out during the live stream. You'll also be able to get a key by doing some missions using Sites with Benefits. That will go live on the Noobist Friday before the stream. Stop on by if you can and check out the game for yourself. The live stream will be at: http://www.twitch.tv/clutcharena on Friday at 7pm EDT. Ever since I started my new job, I have been a little behind when it comes to the latest news. As such, I was quite surprised to learn BioWare was planning on rewarding its subscribers for, well, subscribing. I am a subscriber, so I found that to be pretty cool. It didn't take long to find out what their plans were. As some of you have already begun to figure out, every subscriber is receiving a bonus of 500 Cartel Coins. Some of you may not have gotten them yet but don't worry, the process takes a few hours. All of you should be receiving your 500 coins today. As an additional tease, we have something coming to the Cartel Market later this month that is going to be super, super cheap and available for one day only! All I will say for now is hang on to 10 Cartel Coins and look for details soon™. So all subscribers get 500 Cartel Coins. The 10 Cartel Coin item turned out to be a special title for KoTOR's 10th anniversary. First, let me say thanks for the 500 Cartel Coins. BioWare did not have to give us anything. I'll most likely use them on expanded storage, or an extra Cartel Pack. So it is certainly a useful gift. I could think of a bunch of ways they could of gone that would have been worse. That being said, I was disappointed. Cartel Coins just seems like the easy way out. "Oh, just throw some Cartel Coins at them." I was really hoping for something in game instead. Like maybe a permanent XP buff for alts or something else functional, if you know what I mean. It could have been something that would tempt free players to become subscribers. A one time payout just seems lazy, not to sound harsh. I appreciate the coins, but I think some more thought could have been put behind it. Time-deduction payment? This is certainly something we have not seen before. Obviously, the thought of an incoming free to play change was brought up. Sadly, this is probably not the case. Remember way back when WAR had a Korean server, and was using a different business model? This reminds me of that. How it ended up back in the game is anyone's guess. Just a bug I, sadly. It does pose an interesting question: Werit, if WAR went F2P would you come back? I think the answer to that would be yes, but it has nothing to do with money. It would show that the studio was making an effort when it came to WAR. That's not to detract from the people currently working on the game, but it takes a team to run a game. That effort would restore my confidence in the future of WAR. One surprise feature of SWTOR's 2.3 patch is the arrival of a new companion, Treek. This would be the 2nd universal companion to go along with HK-51. There is one key difference, Treek is an Ewok and HK-51 is a cool robot assassin. I am not a fan of Ewok's. I didn't like them in Return of the Jedi, and I don't like the idea of having one that is a companion. That presents me with a bit of a problem, as I hate to miss out on any content. The Ewok comes with a set of quests which are different depending on which side you are on. Data mined info, spoiler warning! The way you obtain Treek is also underwhelming. With HK-51 we got an interesting questline that took us to a new location. To get Treek, you buy a Mercenary Contract and that's all there is to it. It ain't cheap either, it is 1 million credits and requires Legacy level 40. According to Community Manager Eric Musco, we can also obtain Treek through the Cartel Market without having to worry about those in-game requirements. I'm torn about this. On one hand you have something high level Legacy players can strive for. On the other, I am no where near level 40 so could get this companion if I was so inclined. Overall, I feel underwhelmed by this new addition. At the very least, I would have preferred an involved quest line to obtain Treek instead of just buying access with in-game money or cartel coins. As of now, Treek is not something I will buy. That could change though, I'm weak. Most of my reduced game time has been spent in SWTOR lately. The main reason being: double XP! I wrote before about how double XP weekends actually make me play less, but that is only when it's not such a weekend! Now that it is, I can't wait to get into game and make some progress. I've been playing on my Trooper for the most part. He has been deployed to Makeb for a while now. One issue I have with the newly introduced planet is that the missions don't seem to give enough XP to keep you on level. I found myself 2 levels short of what the next mission required. Not that it is a major issue, as the difficulty is low, but I like to be on level. Double XP changes all that. I was able to catch up to the mission level pretty easily thanks to doing some warzones and their associated missions. When I hit level 52, the Macrobinocular and Seeker Droid missions also became available to me. So far, I did the first part of the Shroud missions (Macrobinocular). I actually enjoyed it quite a bit. I rode around Coruscant and found the objectives. That resulted in a nice 'chat' with the Shroud which was cool. They want me to go to Taris next, which is where the Seeker Droid missions start up. I'll probably save Taris to do this week sometime as it looks like it can be done at my own, often interrupted, pace. I will turn in the completed missions on the weekend. For the double XP weekend, I'll be doing my Makeb missions since I will have longer play sessions. I'm entering a new phase when it comes to my gaming life. When I worked at home, it left me with a lot of free time which I naturally used to play games and make stuff. My kids were also young and took wonderful naps in the afternoon. As they say, all good things must come to an end. I decided that it was time to move on from my at-home job, so I could advance professionally. It's hard to do that when no one ever sees you, working in an office does have its upside. Along with the new job comes a commute, which takes up a good sized chunk of time each day. I like to get into the office early, so staying up late to play is not something I want to do. My kids are also now at an age where they don't take much in the way of naps. So that free time was gone anyway. I have to watch them, rather than play games, can you believe that? :) For a while, the most time I could get to myself on a weekday was about 1 hour. That makes it tough to play a MMO, much less multiple. So now I find myself with maybe 5 hours of play time a week , which makes me a really casual gamer. That's kind of funny to say. Back in the 90's, AOL gave you 5 hours a MONTH to be online. I somehow played Neverwinter Nights and Federation, going over my 5 hour limit sometimes. They really made you pay for that, much to my mothers delight. Having single digit hours a week to play games means I am going to have to make some sacrifices. Right now, SWTOR is the only online game I am playing, and that's only once or twice a week. The rest of my time will go to single player games and other activities like watching the DVR. I'm going to miss the days which I could play for 2 or 3 hours each and every day. But that's just the way things go.